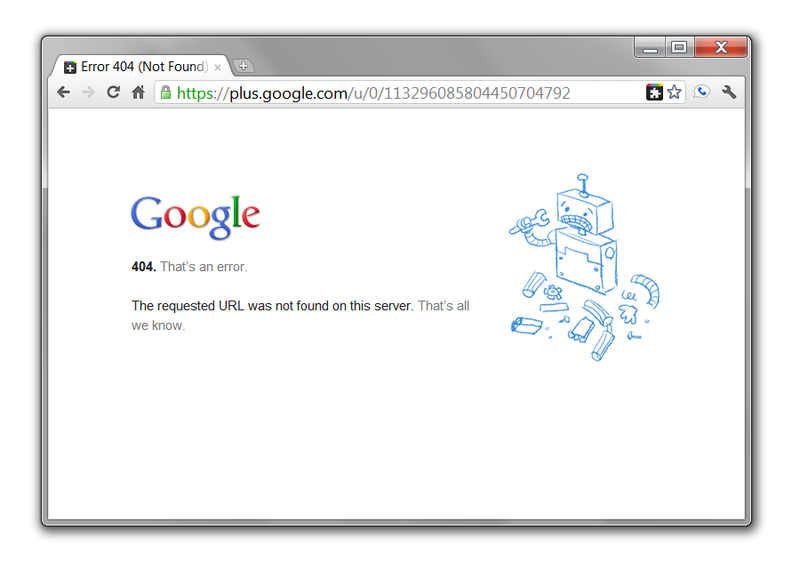 The other day I was on the new Google social tool called Google+ (the way that is read is “Google Plus”) and I found myself given a 404 Error page. I don’t know if this is across Google or just for Google+ but it seems I have discovered another Fail Pet (or as I call them, Fail Cutie) to my list which I first started here and continued here. Any ideas what we should name this robot? There were some suggestions on Twitter but I am still open to suggestion. Let me know in the comments! We came up with a new term at the Tweetgasm on March 21 – Quantum Recreation! Before I continue I think I should explain what the heck a Tweetgasm is – mainly because a lot of people on Twitter were confused when we were tweeting about it on Monday. Tweetgasm is: The monthly tweetup at The Gladstone Hotel (@GladstoneHotel), with an awesome party in the Melody Room. We all came and enjoyed a drink (ok, maybe a few more than one) and mixed and mingled with fellow Toronto Twitterati. Hosted by @photojunkie, this past month we spent the night being entertained by the awesome DJ duo, Speedboats and Big Explosions (@SBBEmusic). After the DJ Duo had wrapped up and most people had already left, John Edgar aka @JEdgar, Sacha Sayan aka @SachaSayan, Allegra aka @CapnAllegra, and I all remained amongst a few others talking. I told either Sacha or John I am working now for the QR Agency and he asked me if I knew what QR stood for*. Before I could answer he answered it himself by saying “Quantum Recreation?” and laughing. Once he had come up with that term we decided we needed to define exactly what it is. We decided that since quantum means: the minimum amount of any physical entity involved in an interaction (I took that from Wikipedia’s article on “Quantum“) Quantum Recreation therefore meant a small amount of fun. But then we continued with our ridiculousness saying, well if it is such a minute amount of fun did it even happen? Maybe Quantum Recreation is fun so brief it didn’t even happen? OR – and this is where we came up with our stroke of genius – maybe it is fun that never happened because we will never, ever speak of it again! Much the way it is said “What happens in Vegas stays in Vegas”, referring to the idea that any activities or fun that is had of a nature which might disappoint or anger other people back home does not ‘come back with you’ from the party city of Las Vegas, that is exactly what Quantum Recreation is. Much as with the thought experiment of Schrödinger’s cat where the cat existed as both alive and dead in the box until it was observed by a human, quantum recreation never happened and did happen unless observed by a human in which case they and they alone can know the truth. Trippy isn’t it? I put this word on the Urban Dictionary so when it gets reviewed and posted onto the site (it is under review right now) I will post a link and let’s get it fully approved!!! *I do know what the QR in QR code stands for – it stands for Quick Response. 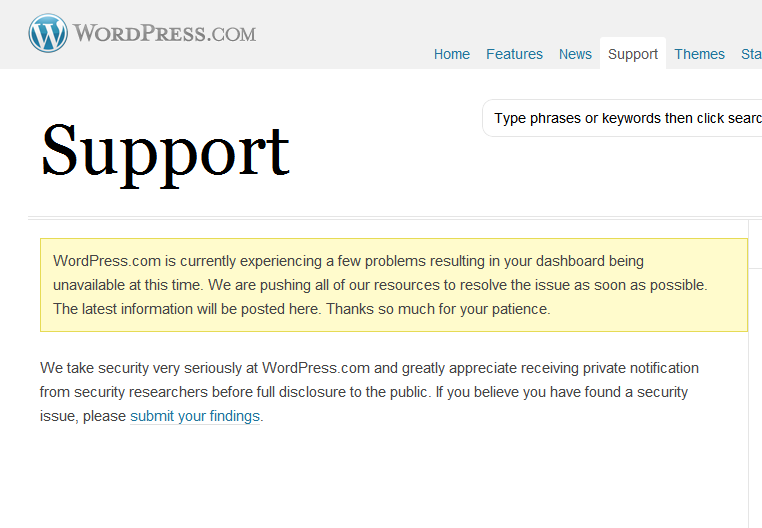 Thankfully, WordPress doesn’t have glitches or issues which cause WordPress.com to go down very frequently. HOWEVER, given the massive issues which happened with WordPress hosted sites on March 22 I got to know the WordPress 504 Error Page pretty well. There were actually two incarnations: the one pictured here and one that I, unfortunately, did not have the presence of mind to screen cap. I move for WordPress to introduce a Fail Mascot aka #FAILcutie of their own! Twitter has the Fail Whale and Fail Robot, Klout has the Klout Puppy, Tumblr has Tumbeasts, and there list goes on. 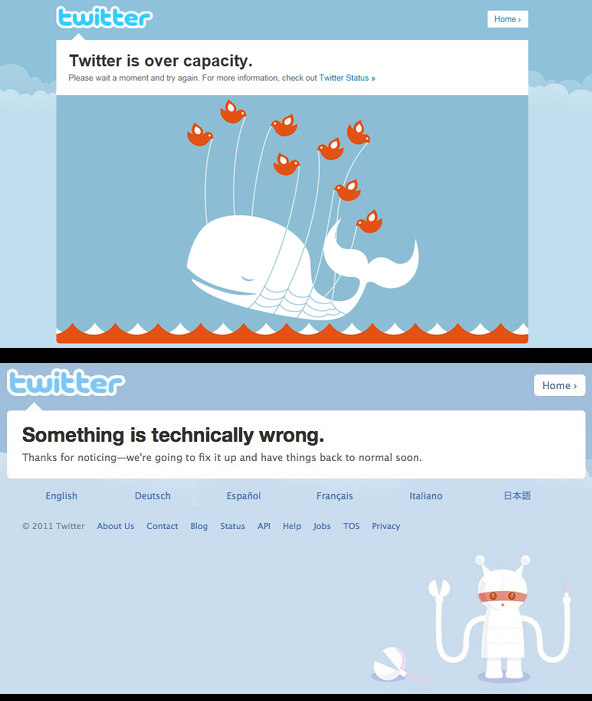 Fred Wenzel over on the site “fredericiana” wrote multiple posts about them and has updates about what he calls Fail Pets – I hope he doesn’t mind that I borrowed the picture of the Twitter Fail Robot from him when I made the picture to your left. Mashable‘s Erica Swallow wrote a whole post in September 2010 – “35 Entertaining 404 Error Pages” which shows although we hate getting the errors if there’s something cute about it we can at least appreciate it…after all society does teach us that laughter is the best medicine! But what should WordPress’ Fail Mascot aka Fail Pet be? Well their logo is a ‘W’ in a circle but as we have seen from Twitter and Klout and Tumblr the type of mascot chosen does not necessarily have to have anything at all to do with the nature of the site. Really it could be anything that’ll put a smile on our faces…cute helps too because, come one, how can you be angry when you see the Klout fail puppy? It’s so darn cute! Any ideas as to a new WordPress Fail Mascot I would love to hear! Maybe some day they’ll even use it! Vote Pedro…Wait…No, That’s Not Right. VOTE ZACH! The contest requires you to either sign up – the first time voting you need to signup for an account which is a couple of minutes process and reports have come back from people already registered that they do not send you any unsolicited emails. Personally, I have been clicking the Login With Facebook Button that is offered when you click the Vote Button but apparently some people don’t like to connect their Facebook accounts with other things online. To each their own. So why am I pushing this aside from the fact that Zach is a good guy? 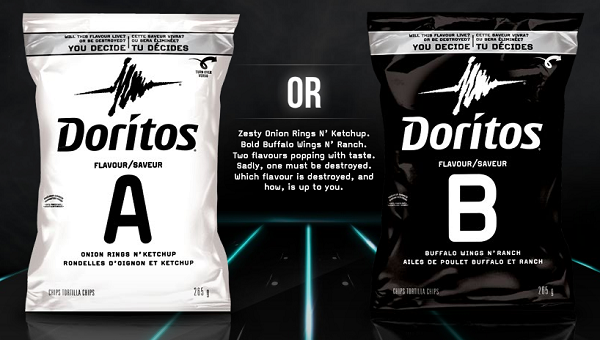 It isn’t because I truly believe that the Buffalo Wings n Ranch flavor (the one Zach chose) is freaking awesome because I have yet to try either. So my reasons beyond Zach is a good guy are twofold, in no particular order they are: PARTYING & CHARITY! The grand prize for the whole shebang is $25,000 – ya, that’s TWENTY-FIVE THOUSAND DOLLARS!!! Of that money, Zach has committed to donate TEN THOUSAND DOLLARS ($10,000) to charity. You might be thinking, “Wait, what? Why isn’t he going to donate at least half of the $25,000 to charity? Dan, you said Zach was a good guy!” BUT I’m not finished, so keep reading! Zach is going to take $5,000 from the winnings and throw a huge victory party as a thank you to everyone who voted for him and supported him in this cause. I like the sound of that! Don’t you? 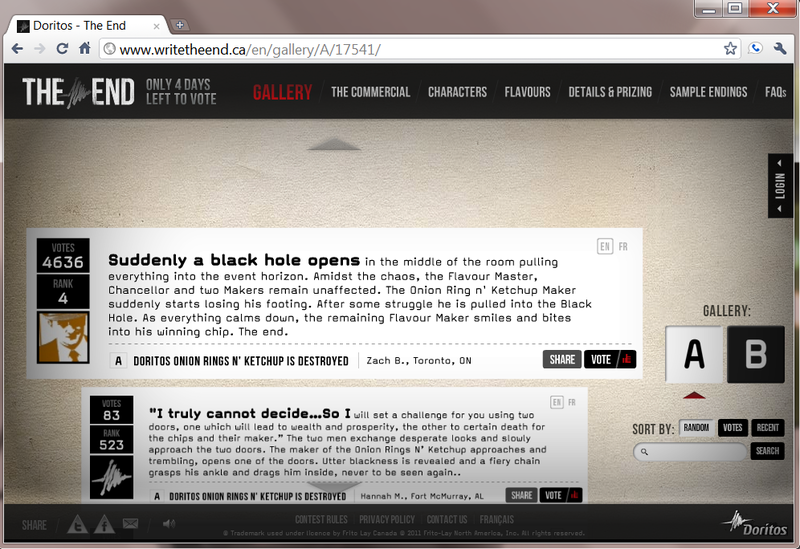 This is why I am urging you to vote today at http://bit.ly/VoteZach! If you live in Toronto it is in your own interest – the party will be epic – and even if you don’t we’re talking TEN THOUSAND DOLLARS TO CHARITIES WHO REALLY NEED IT! The other ten thousand bucks that’s left over will go towards a startup that Zach wants to get off the ground. Who knows, it could end up being the next Facebook and you’ll know that YOU helped make that possible. $3,500 reserved to send me somewhere that needs volunteer help and money. Whether that’s helping with the continued oil spill cleanup, assistance to one of the many earthquake ravaged nations, etc. I will seek out a group to travel with and physically go down and help in any way possible. I’ll document this trip with videos and through my blog. TWO donations of $1,500 each donated to charities chosen by you! (Leave suggestions in the comments below [Dan’s note: comments on Zach’s blog but if you write them here I will ensure he gets them and will attempt to persuade him to count them, but no promises], the 2 with the most suggestions will be selected). He is currently in 4th place but we need to make this final push and get him some more votes! WordPress FAIL, My #PostADay Challenge Continues Anyway! The WordPress error page I received tonight when I tried to write a blog post before heading out. So why aren’t I writing the post I wanted to write tonight? Well, honestly it is because WordPress’ site was down as you can see from the error page above and the “updated info” on the issue below. Tonight, after work, I was all set to sit down at 5pm and blog before heading out to Lou Dawg”s – http://www.loudawgs.com/ & @LouDawgs on King St West for the #DawgsTO tweetup which was called for 7pm and I got the error message I screencapped for you to see. I waited and kept trying to load the page thinking, “This’ll be fixed quickly and I can get my blog post done”, but I was wrong. When 6:45 rolled around and I still had no access to “Create New Post” option on WordPress.com, there wasn’t any new info on the Support page, and I was already going to be late to this tweetup (its 7:45 and I’m at St. Patrick Station) I knew I had to start heading down from “The Jewrisdiction” as I call it in real life and on Foursquare get to Wilson Station, and head downtown to King West. As usual, I am giving every one of my readers the whole truth and nothing but the truth. Could I have written the post I wanted to earlier in the day? Sure, I suppose…but how many bosses do you know who’d take kindly to you working on your personal blog when you’re supposed to be working? And don’t you dare say you think “the Bobs” from Office Space would be cool with it because they were consultants hired by corporate, not technically Peter’s boss. Lumbergh was Peter’s boss! So, ha! The WordPress Support Page, “They’re working on the issue” but I’d already waited more than an hour and couldn't wait any longer. "There Are Some Questions That Can't Be Answered By Google." I am confused as to where the Microsoft Bing logo is on this sign...I don't see it anywhere! 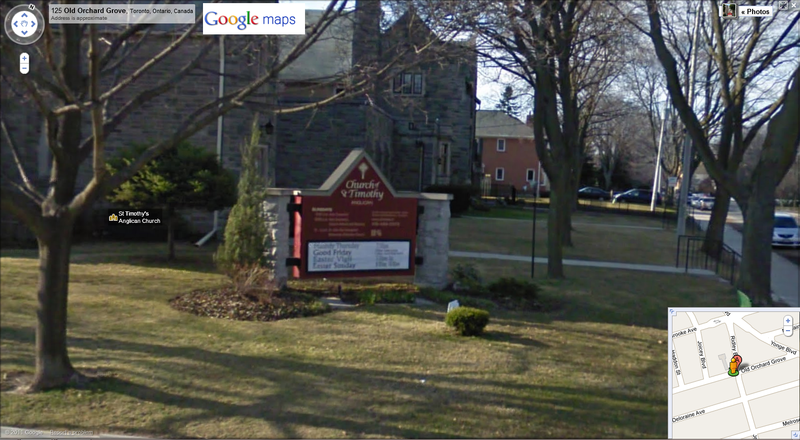 I have seen this church mentioned/pictured before in the media and on the interiorwebs but the other night I was passing by and saw this sign as I stopped at the stop sign across the street (like the good law-abiding citizen I am) on my way home from the Tigits Launch Party. 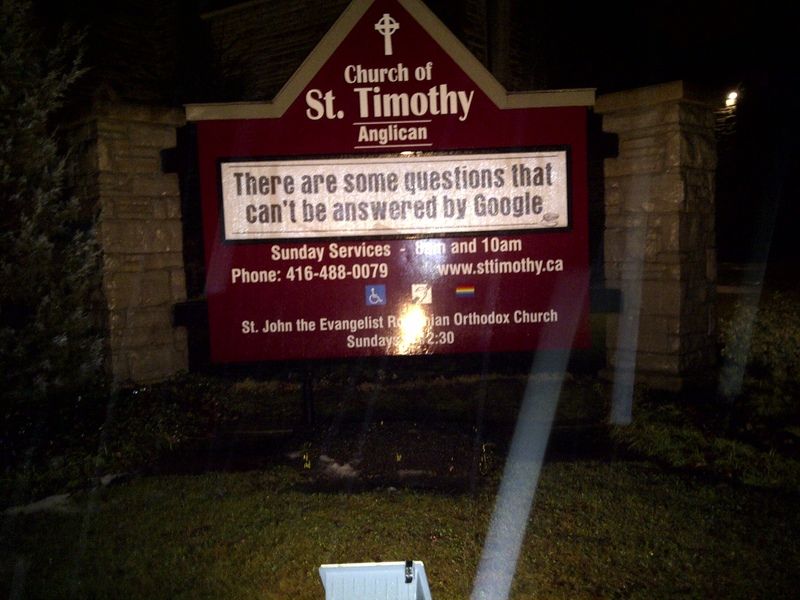 According to the Anglican Church of St Timothy at 100 Old Orchard Grove in Toronto “There are some questions that can’t be answered by Google.” I looked around to see if I could find a Bing logo or a Microsoft logo anywhere on the sign or a Bing logo but found nothing. I was really expecting to see something, somewhere…I think the marketing department at St. Timothy’s might need a hand with this as they could probably be making some serious coin if they kept that up for a while and just slapped a Bing logo on there. You might be thinking that I completely missed the point of the sign and they were trying to reference the Church or God or Christianity (or all of the above) having the answers and not that we should switch search engines. However, being a Jewish computer geek this is immediately what sprang to mind so I thought I’d share it with you. I hope no one finds that offensive. However, if you do I suggest you step back and re-examine why you are offended…clearly this is a snarky comment being made by the church and it is meant to draw attention to it. Therefore me posting about it means the sign did its job. If even one other person (preferably an Anglican Christian I’d guess) sees this sign and learns about the existence of the church and decides “Hey, if they’re gonna be trying so hard to be hip and cool with the kids today mentioning the interwebs on their lawn sign maybe I should check them out” then that sign has done its job. I look forward to seeing more funny sign posts from you Anglican Church of St Timothy. 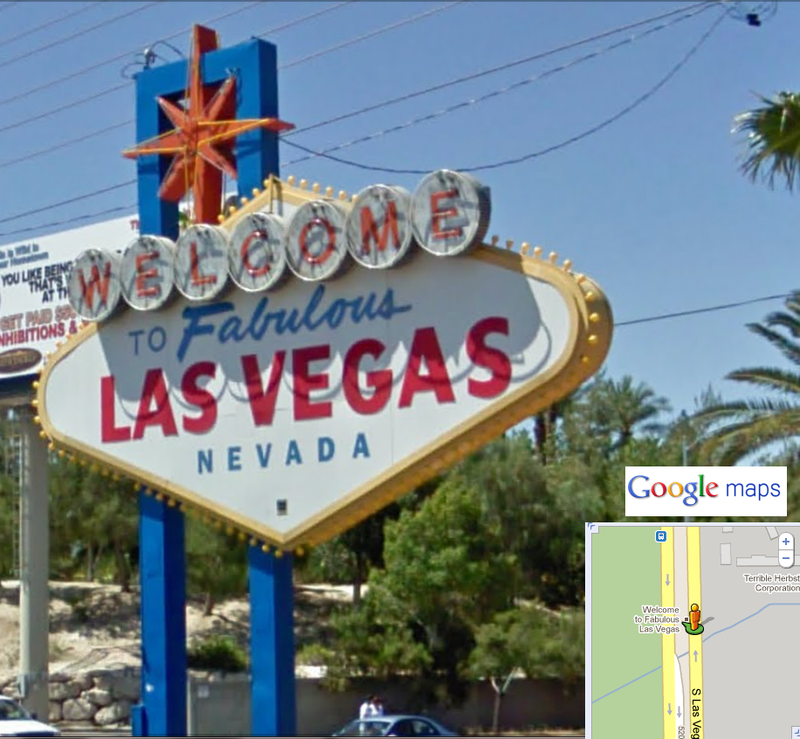 When I went to you guys on Google Maps Street View – see they DO have the answers! – all I got was times for Easter services and a different sign that was missing the rainbow flag. I hereby grant you guys the title of “Coolest Church Lawn Sign In Toronto” and “Coolest Church Lawn Sign In The Greater Toronto Area”. Although I don’t spend very much time reading church lawn signs so you may want to take that title with a grain of salt; nay, an entire salt shaker. Last night I mentioned the supermoon and was all excited to see it in its amazing glory. Maybe, it was the fact I was in Toronto and we are at a higher latitude than that amazing picture I posted from Washington, DC. Maybe I had to catch the Super Moon at ‘moon rise’ and not in the middle of the night. I don’t know but what I do know is I wasn’t alone in being disappointed in the Super Moon. Other people in my Twitter stream were similarly unimpressed. Oh well, guess I will just have to wait until 2029.